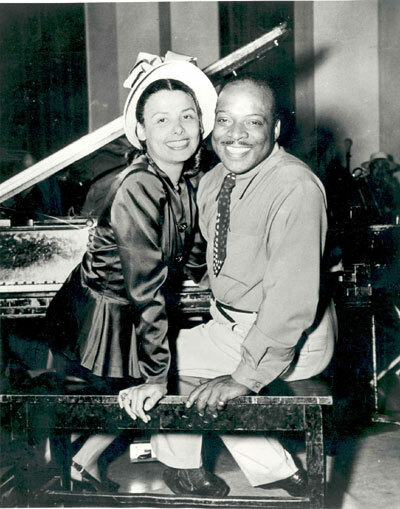 Lena Horne and Count Basie in the 40’s. Now before you ask, no, I did not take this wonderful photograph nor was I there when it was taken. I found this wonderful gem while surfing the web and wanted to share it. I have not been blogging much these days. I am working on a big project for work that has taken much of my waking hours. Soon, I will be done and back to writing. In the meantime, I have been listening to some good music that I will tell you about real soon. This entry was posted on Monday, February 9th, 2004 at 7:09 am. It is filed under Random Thoughts and tagged with Charnett Moffett, Count Basie, Eric Harland, Eric Reed, Lena Horne, McCoy Tyner, Paula West, Pharaoh Sanders, Ravi Coltrane. You can follow any responses to this entry through the RSS 2.0 feed. Wow! That photo is indeed a gem!! I wish you had taken it so that I could drive us to the Bank! 🙂 Do you know how old Lena was in the photo? She looks in her 20’s if not younger. Very nice photo! Thanks for sharing. This year be the centennial anniversary of Mr. Basie’s birth, a fitting photographic tribute. Been missing your writing. Don’t work too hard and have a wonderful Valentines Day! yes i was gonna ask did you take that picture *lol* just kidding. seems like everyone is taking a break or busy with other things instead of blogging. good luck on the big project but i’m sure you will get it accomplished with great results. have a happy valetine’s day.